Many manatees are injured or killed by collisions with powerboats. Manatees occasionally ingest fishing gear (hooks, metal weights, etc.) while feeding. These foreign materials do not seem to harm manatees, except for monofilament line or string. This can get clogged in the animal’s digestive system and slowly kill the animal. Manatees can also be crushed in water control structures (navigation locks, flood gates, etc. ), drown in pipes and culverts, and are occasionally killed from entanglement in fishing gear, primarily crab pot float lines. For a century, popular belief has held that manatees are dimwits. But recent research at the Mote Marine Laboratory in Sarasota has demonstrated that manatees are smarter than was believed. Experiments under way at the independent Mote Marine Laboratory could help scientists protect Florida’s manatees, an endangered species, from propellers and other dangers. At least 75 manatees have been killed this year in collisions with watercraft, according to the Florida Fish and Wildlife Conservation Commission. Despite recent findings that suggest the animals hear well enough to avoid boats, researchers are not sure why manatees keep getting hit. They could be surfacing to breathe while sleeping, or they may have grown too accustomed to the sound of boats. At the Mote laboratory, the buzzer experiments are hearing tests in which the tones gradually grow shorter and softer. The researchers want to know: At what distance could [a manatee] hear a boat’s propeller churning in the water? [Can they] determine where the sound is coming from? … The manatees have been trained to respond to whistles and stop at underwater targets. Scientists want to determine how well manatees distinguish colors and objects, and how sensitive their hearing and sense of touch are. 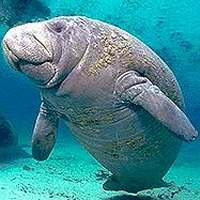 The Mote Marine Laboratory web site features two pages of manatee videos: research videos and training videos. There are 2 reader responses to "Manatees May Be Smarter Than We Think". i really want to help save these domestic creatures! Manatees are so cute and cuddly-looking. I want to snuggle with them.